Falconry -- Birds that I have flown. Many years passed before I flew another bird. 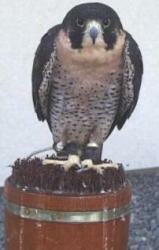 The second bird I flew as a falconer was a Peregrine Falcon (F. p. brookei) named Dirk. This being my first attempt with a Long-wing, I made plenty of mistakes, but it was a great learning experience. I spent many afternoons out in the local dairies, hawking small birds. My next bird probably taught me the most about the sport. He also taught me patience and the need to be very meticulous in my falconry. 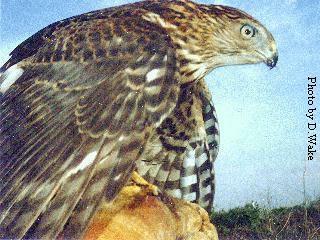 Wyatt was an eyass tiercel Cooper's Hawk (Accipiter cooperi), and my first Accipiter. I flew Wyatt for 5 seasons, and had many memorable flights. By his second season he was an adept hunter, and he and my Brittany became a very effective team. I flew him both from the fist as well as by having him follow me and the dog through the fields. While I was flying Wyatt, I wrote a handful of articles on my experiences with him that were published in a few Falconry Journals, both in this country and abroad. 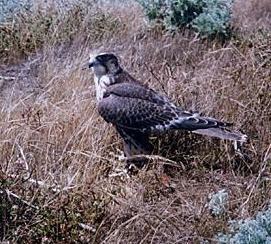 While flying Wyatt the last few seasons, I also flew an eyass Prairie Falcon (F. mexicanus). This little guy I named Chance, as I didn't think there was a "chance" in hell that I would have any better luck with him than I had had with my first long-wing Dirk. 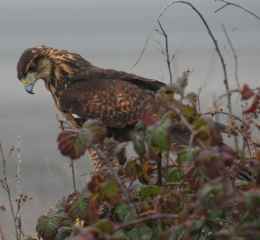 I am happy to say that I was wrong, as Chance proved to be a very game little Game Hawk! Unfortunately, living here on the north coast proved to be too damp for this desert bird and many days we were grounded due to the rain, so I made the decision in his second season to transfer him to a Southern California Falconer. Odin is a Peregrine Falcon (F. p. anatum) and to date is probably my favorite bird of the birds that I have flown. He was the last offspring produced by Dolly of "The Rites of Autumn" book. 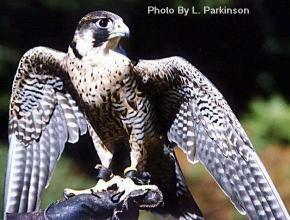 Odin took numerous types of quarry in the time that I flew him, and was a great bird to be around. After sharing 5 years with this bird, it was difficult to make the decision to make, when I transfered him to another falconer when my schedule prevented me from flying a long wing. 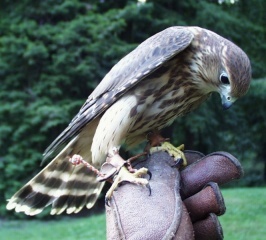 Moya is a Merlin(F. columbarius) that I had for a few years. As a strong imprint, she was a very noisy little bird! I didn't really get many flights with her, as she was aquired for my breeding project that never came to fruition. She was transfered to another breeding project where she produce hybrid offsping in her third year. 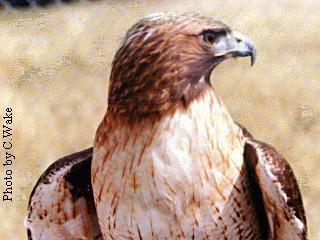 Dargo is a male Harris' Hawk (Parabuteo unicinctus) that I flew for the seasons 2003, 2004. 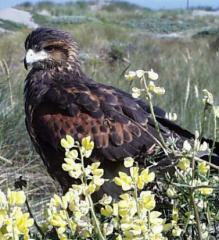 This picture was taken on day 17 of his training, We are out hawking small birds in the coastal dunes. His first season he took 99 head of game, most of which were sparrows taken in 'classic' style over my Brittany. Not exactly the exlplosive flight of the Accipiters, but fun none the less! He is currently being flown by T. Nichols in Redding California. 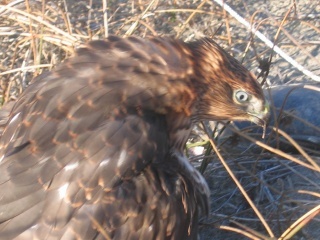 Gary "Cooper" was a Cooper's Hawk(Accipiter cooperi) (3/4 Eastern x 1/4 Western) He was part of the reason why I made the hard decision to give up the sport for a couple of seasons. Flying Cooper's is challenging enough as it is, add to it all the obstacles of falconry in restricted areas, and it becomes almost impossible.